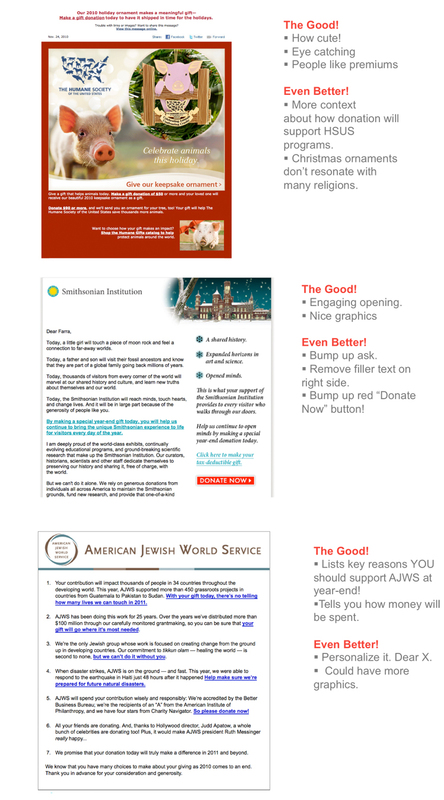 Year-end fundraising is here. This is the time of year that your organization should be raising up to 40% of its donations online. Yes, that’s right - up to 40% of donations come in at the end of the year for many nonprofits that have a solid year-end fundraising plan in place and an engaged list of supporters. Looking for some good data and examples for your fundraising team? Check out some of the info and screenshots I shared last week on the Blackbaud webinar Year-End Fundraising Campaigns that Rock with Frank Barry from Blackbaud and Kai MacMahon from Autism Speaks. The average 1x donation is $60.00. – eNonprofit Benchmark study. Have a clear call to donate in the form of a big bold button. This should be incredibly obvious in your navigation and in a callout box towards the top of your website. If you want to raise money, the donate button should not be buried and de-emphasized on your website. This is one of my favorite tips from Alia Mckee over at Sea Change Strategies. After you finish reading this blog post, give two of your friends $10 and ask them to donate money to your website. Ask them to share their donation experiences with you. How was the flow? What was confusing? Did they get frustrated at some point and not want to complete the donation? Tell them to be brutally honest. Provide compelling reasons to donate and tell donors how their hard earned money is being spent. BTW donating money to general operating expenses is not a compelling reason to donate. It should focus on programs that are helping you meet your mission. Be sure and also provide clear donation information with options for different types of donations - one time, recurring, etc. Thanks to our friends Farra Trompeter over at Big Duck and Avi Kaplan of Rad Campaign we compiled several year-end fundraising appeals from 2010. Three of them are featured below. Like with any good fundraising appeal or campaign, there are elements that shine and some simple ways organizations can make them even better. What are your favorite strategies or examples for year-end fundraising?